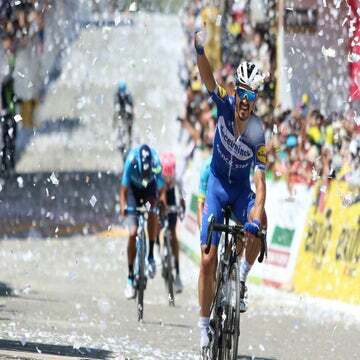 The 22-year-old Colombian sprints to victory in stage 2 thanks to a perfect lead-out by Deceuninck-Quick-Step. 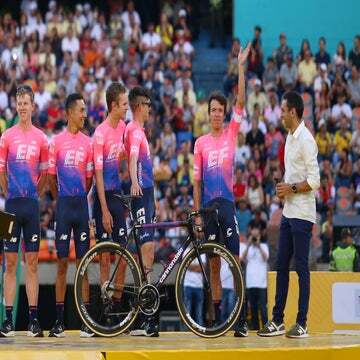 The Colombian fans cheered one of their own to victory Wednesday at the Colombia 2.1 stage race, except instead of sprint favorite Fernando Gaviria (UAE Team Emirates), Alvaro Hodeg (Deceuninck-Quick-Step) won stage 2 in La Ceja. Hodeg, 22, delivered his first victory of 2019 after a masterful lead-out by his team. Martin Laas of American Continental team Illuminate finished second with Gaviria’s UAE teammate Juan Sebastian Molano taking third. Thanks to a time bonus in the 150.5km second stage, Hodeg seized the overall race lead from fellow Colombian Rigoberto Urán (EF Education First). Six breakaway riders were caught inside the final 10km of racing, setting the stage for a sprint finish. As the race came into the final 500 meters, Deceuninck-Quick-Step lined up on the left side of the peloton, driving the pace. Max Richeze, formerly Gaviria’s key lead-out rider, was the last to pull off the front, disrupting a charge coming up the right side. This left Hodeg with an open road to close the deal on his first victory of the season. The six-day race serves up another circuit stage Thursday around Llanogrande. The four-lap stage 3 features a 3.9km climb of Alto el Nano on each lap, as well as a short 1km kicker just before the finish line. The stage will run 167.6km.